Shane McMahon on top of the Cell. The 10th edition of Hell in a Cell is scheduled to take place tonight. There are currently 8 matches advertised for the Event. The event will feature 2 Hell in a Cell matches, one featuring Raw Superstars and the other one featuring Smackdown Live Superstars. Mick Foley, who has been a part of some brutal Hell in a Cell matches, will serve as the Special Guest Referee for the Roman Reigns vs. Braun Strowman match. Apart from these 2 matches, there are 6 other matches on the card too. Although these 6 matches won't take place inside the Cell, they have the potential to be quite decent. The build-up for matches like AJ Styles vs. Samoa Joe, Dean Ambrose & Seth Rollins vs. Dolph Ziggler and Drew McIntyre and Charlotte vs. Becky Lynch has been exceptional. Although it's believed that Hell in a Cell will end up being a predictable PPV, you should expect some twists and turns. From impromptu matches to swerves, there is a lot that can happen. 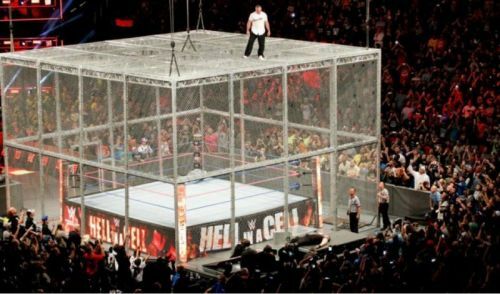 So, here are 7 things that you can expect at tonight's Hell in a Cell PPV. Seth Rollins has been feuding with Drew McIntyre and Dolph Ziggler for almost 3 months. McIntyre and Ziggler had Rollins outnumbered for quite some time. However, things got interesting when Dean Ambrose returned from injury last month to help Rollins in evening the odds. Ambrose and Rollins are now scheduled to battle McIntyre and Ziggler for the Raw Tag Team Championships. Now, it's a fact that almost every event features a match that ends up stealing the show. The Raw Tag Titles match will likely be the show-stealer at Hell in a Cell. Everyone is aware of how well Ambrose and Rollins work together. McIntyre has improved a lot since 2014 and Dolph Ziggler is well, Dolph Ziggler. So, when you put together 4 amazingly talented Superstars in a match and give them sufficient time, expect a masterpiece. Rollins and Ambrose vs. McIntyre and Ziggler will be a show-stealer and it would be difficult for other matches to follow.